Buy So Free (Plamil) Dairy Free Alternative to White Chocolate 70g in the UK from our online shop or directly from our independent Scottish store. This dairy free alternative to white chocolate bar is vegan chocolate and is also nut free and gluten free. 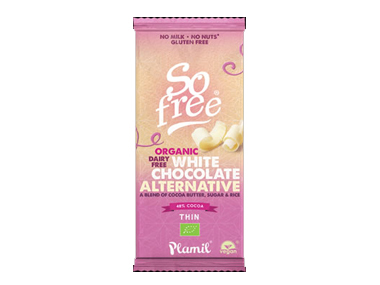 So Free is the new name of Plamil chocolate and is made in a nut free environment. Due to limited space we only keep some So Free dairy free chocolate bars in stock. We can, however, order the full range in. Please phone (01786-464903) or visit the shop (29 Dumbarton Road, Stirling) for more information. This panna cotta is made with vegan chocolate and vegan gelatine. Topped with (wild) strawberries and blueberries, it makes a happy and healthy dessert! This recipe contains 1 bar white chocolate (70g). Where can you buy real Dairy Free White Chocolate safely online? If you are wondering where you can buy So Free (Plamil) Dairy Free Alternative to White Chocolate 70g safely online in the UK, then shop with us. Dairy Free White Chocolate - So Free (Plamil) Dairy Free Alternative to White Chocolate 70g in Chocolate and Confectionery.